We created Plum Deluxe to be like a good friend – one that you always look forward to hearing from. My goal with Plum Deluxe is to create a place on the Internet you can always look forward to visiting, whether that’s exploring our blog and articles, joining our tea of the month club community, or trying out some of our other special products, like coloring books and meditations. 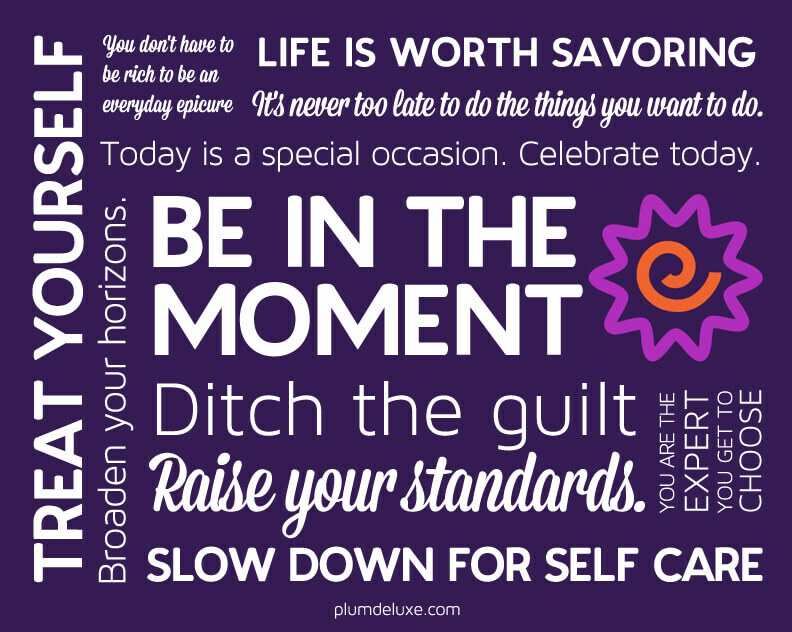 We call this Making Moments that Matter, and Plum Deluxe is here to help you decide what kinds of moments are important to you – in order for you to live a life you love. We have a free worksheet to help you start to understand what moments matter to you. We often get asked about our name – and why we put plums in our teas. None of our teas (at the moment) have plums in them. Plum Deluxe is our name, and the “plum” refers to the old English definition of plum as something that is lucky and unexpected. In more traditional tea cultures, anything that was plum related was said to be sacred and auspiciously special. We felt like this name, paired with the “deluxe” upgrade, was a good representative of the feeling we wanted to create in our community. Plum Deluxe, itself, does not mean anything specific – it’s what you choose to do with it that makes it lucky, unexpected, sacred, or auspiciously special. Our logo is inspired by plum, the fruit – the purple outside with the orange inside. The lines on the outside of our logo reflect the different moments in your life, and the wave of the line shows that in any given moment, there can be highs and lows. This is the external world. The inside of the logo is smooth, and reflects our ideal inner emotional state. Together they symbolize that if we have a strong inner calm, we can handle any highs and lows in our external world.